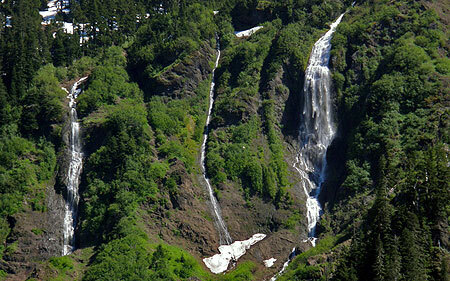 Scores of little-known waterfalls hide in Mount Hood’s backcountry. Some are towering glacial torrents, while others are quiet forest cascades, framed in moss and maple leaves. 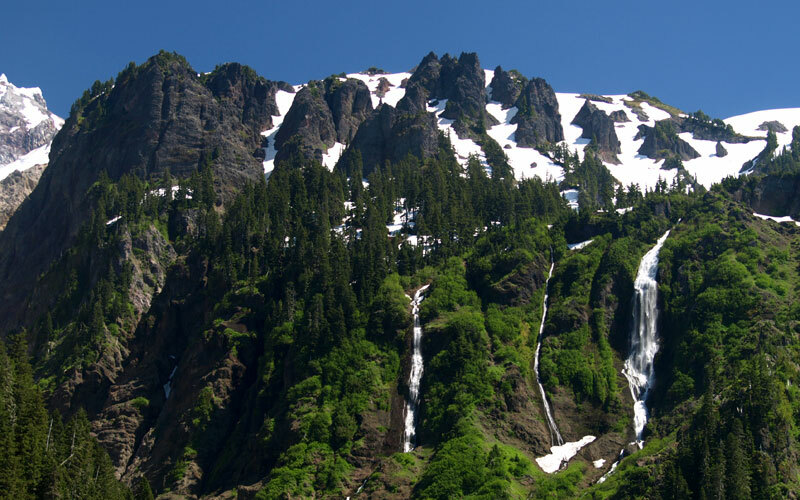 But when conditions are right, few rival the towering trio of waterfalls that mark peak snowmelt on the upper ramparts of Yocum Ridge. These waterfalls are unnamed and unmapped, but familiar to hikers crossing the Muddy Fork on the Timberline Trail or visiting McNeil Point, across the canyon. They completely disappear by autumn in dry years, but in early summer, they are Mount Hood’s roaring counterparts to the famous seasonal giants of Yosemite. 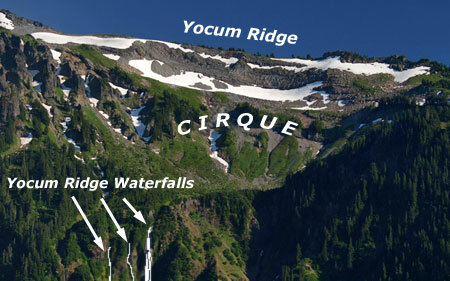 These waterfalls originate from an unnamed glacial cirque, or bowl, high on the northern shoulder of Yocum Ridge, the massive spine that divides the Muddy Fork from the Sandy River, and extends to the summit of Mount Hood. Though they flow from a relatively small basin, the snowfields that accumulate in the cirque each winter generate a surprisingly powerful runoff. In recent decades, the year-round snowfields in the basin have almost disappeared, compared to 1960s-vintage USGS maps (below). This seems to have opened a more direct snowmelt channel to the waterfalls, as they seem more prominent in recent years, while the perennial stream to the west, as shown on the USGS maps, has become much less prominent. The cirque is well below the tree line, so the lack of forests in this amphitheater is also a good indicator of both heavy snow accumulations and frequent winter avalanches. A closer look at the waterfalls, as viewed from below at the Muddy Fork crossing (below), shows the rugged upper crags of Yocum Ridge in the background, with the waterfalls tumbling from the cirque into the Muddy Fork canyon. The cirque is located to the right, just outside this frame. Surprisingly, a sizeable forest is perched on the slopes to the left of the waterfalls, apparently spared by the most frequent avalanches that have cleared most of the slopes within the cirque. It’s somewhat unknown how the streams that feed these waterfalls originate, since they are not mapped, and perhaps not even explored. 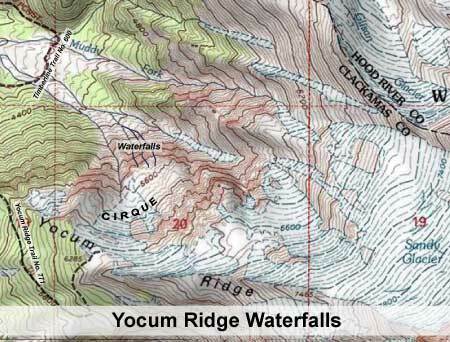 However, from Google Earth imagery, the trio of waterfalls seem to flow from three distinct sources, with the western falls draining the main portion of the cirque, and the middle and east segments draining directly off the upper slopes of Yocum Ridge. 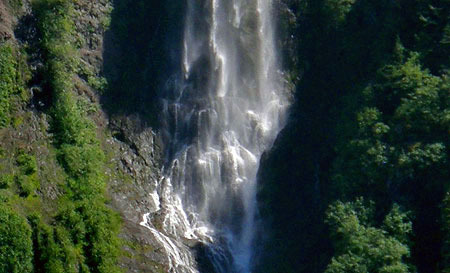 A closer view (below) shows the trio of waterfalls in detail. The westernmost of the three (on the right) is by far the largest, dropping at least 700 feet in the main cascade, and arguably nearly 800 overall. 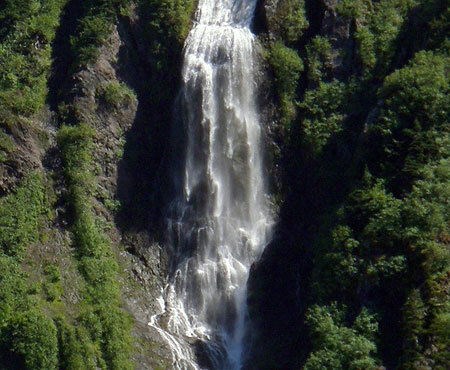 This drop is on a scale with Multnomah Falls, which drops a total of 635 feet, by comparison. The eastern segment (on the left) is next in size, and though dwarfed by its larger sister to the west, is quite large and drops at least 500 feet. The middle segment is a tall, thin slide that is nearly as tall as the western segment, albeit much less dramatic. 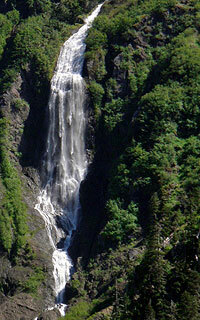 The towering western falls (left) starts out as a 100-foot slide, and quickly fans out for 150 feet before leaping over a wide, 400-foot plunge. The falls collects in a steep amphitheater at the base of the main plunge before making a final 70-foot plunge into a roiling, narrow gorge. A closer look at the main plunge of the western falls (below) reveals the raw power at work during peak snowmelt, with its roaring curtains of falling water. Somehow, thickets of red alder cling to the cliffs around the falls, framing the scene. This spectacle persists for several weeks in early summer, yet nearly disappears in autumn and through the winter. 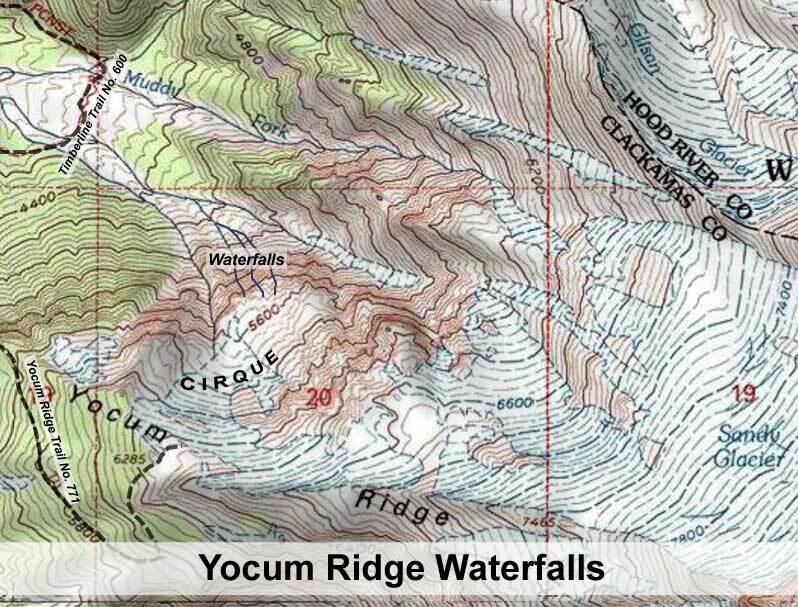 Viewing the Yocum Ridge Waterfalls up close makes for a terrific day hike, and the waterfalls are at their prime as soon as the trails open — usually late June or July. 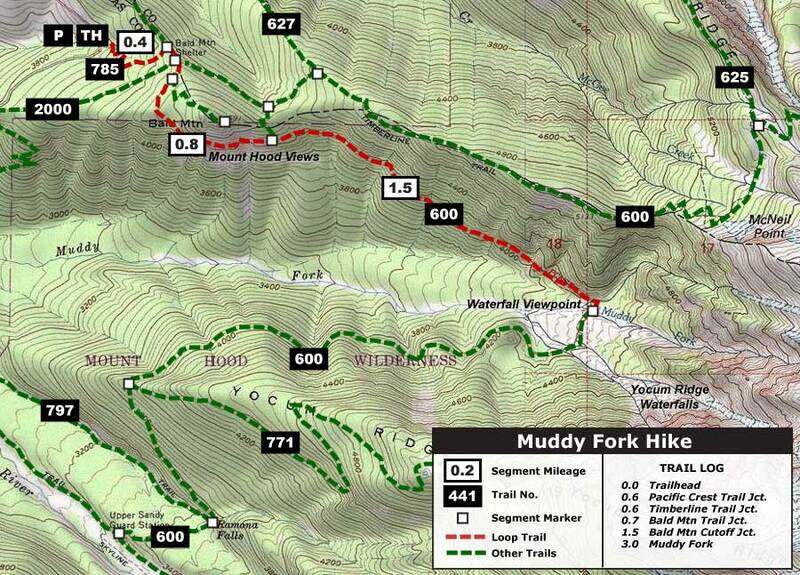 The recommended 5.4 mile (round-trip) hike shown on the map below starts at the usually crowded Top Spur Trailhead, near Lolo Pass. But most of the hikers are heading for McNeil Point, so you will see very few people beyond the series of junctions at Bald Mountain. The Timberline Trail climbs gently through noble fir forest, soon passing the unmarked junction with the Bald Mountain trail. 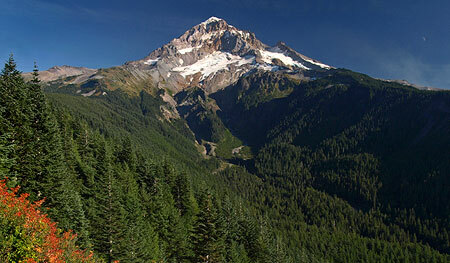 A short distance beyond, the trail traverses across the steep meadows on the south face of Bald Mountain, with stunning views of Mount Hood and the Muddy Fork canyon. After re-entering the forest, the trail passes yet another junction, this time with the unsigned Bald Mountain Cutoff. Head straight, going through a log gate before making a very gradual descent to the Muddy Fork. 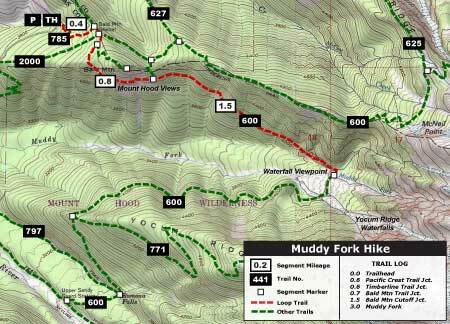 Once at the Muddy Fork, the trail enters the scene of a violent debris flow that crashed through the area in 2002, snapping thousands of mature trees like match sticks and pouring 20 feet of debris across the valley floor. The Muddy Fork has made short work of the debris in the subsequent 10 years, cutting all the way down to its former stream level. 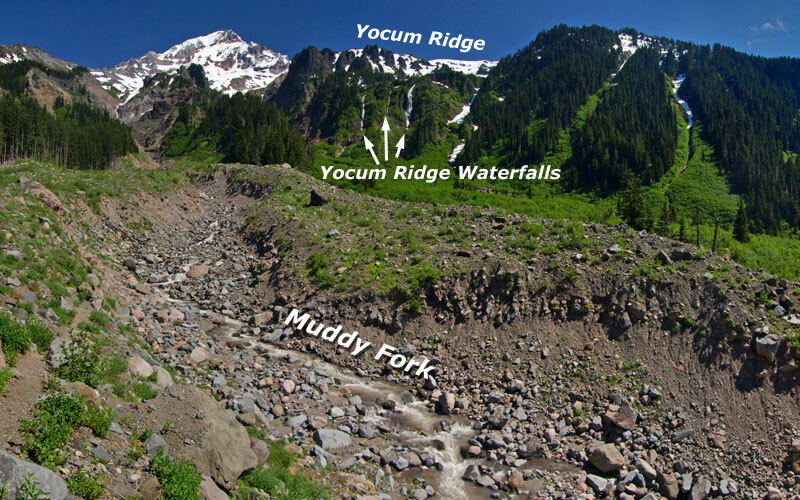 This makes crossing difficult for Timberline Trail hikers, but that’s okay: the best view of the Yocum Ridge waterfalls is from one of the scores of boulders resting atop the debris flow, where you can relax and take in Mount Hood, the waterfalls and the roaring Muddy Fork, below. Be sure to bring binoculars and a camera — and enjoy!